Orangutans storm to the top of the table with a close-fought win against much improved, Friendly Rivals. 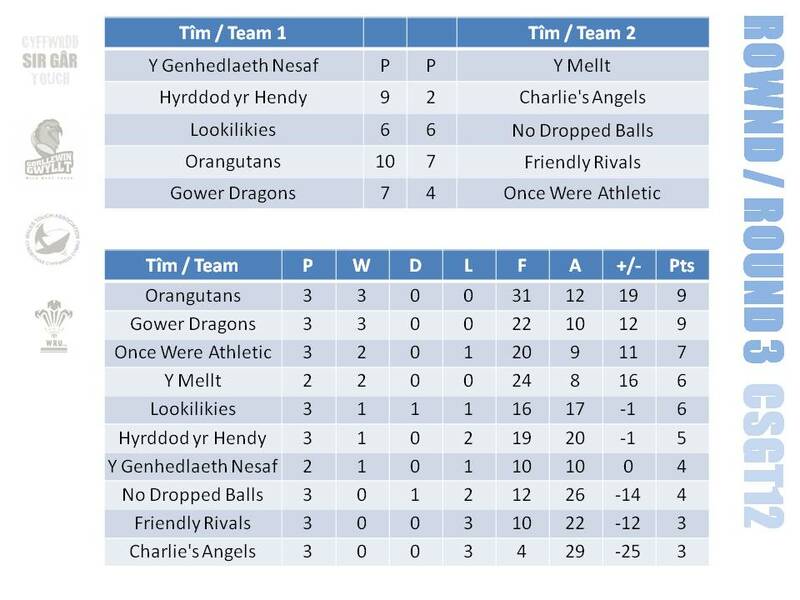 Both teams have been competing in the Llanelli league since the CSGT10 and whilst Orangutans have won two titles and are very much in the running for a third, the Friendly Rivals have made a disappointing start to this year’s campaign losing their opening two games. Despite suffering a third consecutive loss, they remain hopeful that their weekly training sessions will pay off and look to record their first victory in Round 4 against CSGT newcomers Hyrddod yr Hendy. One advantage that the Friendly Rivals have is that one of the team has been training with Wales Men 30+ squad since January. Christen Rees-Jones, could be the first CSGT produced player to win an international Touch cap having only started playing the game in 2010. Chris is training hard each week with the national Mens Over 30s team and is hopeful of cementing a place in the squad which travels to Italy in September to participate in the Touch Euros. Wales are the reigning overall champions having taken the title in Bristol in 2010 and hope to defend the title in one of the Federation of International Touch’s showcase events. CSGT wish Chris every success! Pob lwc! Christen Rees-Jones – the first international player produced by CSGT? Elsewhere, Gower Dragons, another team with a number of representative Touch players, move up the table into second spot with their third consecutive victory, winning 7 – 4 against Once Were Athletic. No Dropped Balls improve on their two losses so far, with a draw against Lookilikies and Hyrddod yr Hendy record their first win in 2012 with a 9 – 2 victory against Charlie’s Angels. The game between Y Mellt and Y Genhedlaeth Nesaf had to be postponed and will be played at a later date.